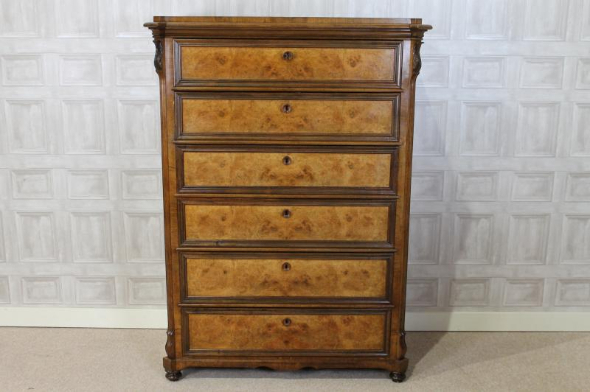 A fantastic example of a late Victorian early Edwardian walnut empire style chest of drawers. This chest of drawers is in an empire style, and could possibly be French or Belgian. It is in excellent condition for its age; all drawer fronts are veneered in burr walnut, and all drawers run smoothly. This walnut empire style chest of drawers has its original key, and would be a lovely addition to any period bedroom interior; either as a stand alone piece, or to match up with existing Edwardian bedroom furniture. We stock a wide range of antique bedroom furniture that would complement this walnut empire style chest of drawers beautifully. Please see our other listings for further details. If you would like any further information about this walnut empire style chest of drawers, please don't hesitate to contact us on 01543 375872.